I knew this series would be dark based off of the first book, but wow this series went farther with that than I originally expected it to. Honestly, I'm so glad this book went there. It stands out from the numerous young adult books that feature characters with special powers. The main character, Adelina, is not the typical main character you'd expect. She fully embraces darkness and feeds off of others fear. She revels in the deaths that she causes and her ambition drivers her further to being a villain. It's incredible to read about because it's such a unique story and Marie Lu artfully depicts Adeline's ambition, as well as her madness. Adelina is not the only stand out character in this book. Due to events at the end of the last book, a new set of characters becomes the main cast of the story, aside from Raffaele and Teren. Teren is very clearly crazy and dangerous and I really liked the direction his character went in. It was believable, but also chilling, especially when it's clear that his mind isn't all there. I'm honestly not sure how I feel about Raffaele though. His chapters seemed the slowest, but honestly he seems like the only one in this series with his head screwed on right. The main reason that I wasn't blown away by this book was because it didn't shock or wow me in any way. I enjoyed the characters and the story, but the plot played out almost exactly as I expected it would. I was hoping that this ending would surprise me like the last one did, but I had predicted how it would end before even picking up the book. The romance in the book didn't overwhelm the plot, but there is somewhat of a love triangle. There also seems to be a bit of insta love with Magiano and Adelina. Honestly, I don't know why someone full of joy would be attracted to Adelina in any way, but somehow that happened. There wasn't really a build up to the attraction and I'm kind of confused by it. I quite like Magiano, but he deserves better than Adelina, especially because she still pines for Enzo. As much as I enjoy the characters and where the story has gone, I was looking for a little more from this book. The beginning was fairly slow and consisted mainly of planning and setting up for the action at the end of the book. If you can get through the slower part, then the end definitely makes up for it with plenty of action. Overall, I did enjoy this book though and I will be picking up the next book. 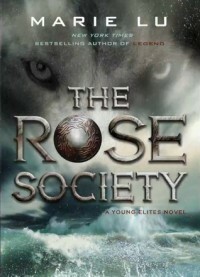 However, my need for The Midnight Star is less than the need I had to read The Rose Society. I'm not sure if it's because I feel like I know how the series will end or if it's because this book didn't end nearly as dramatically as The Young Elites.